↑ ক খ Theodore Ziolkowski (Nov 1, 2011). "Gilgamesh: An Epic Obsession", Berfrois. 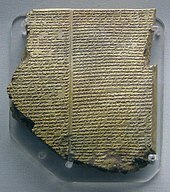 Translations of the legends of Gilgamesh in the Sumerian language can be found in Black, J.A., Cunningham, G., Fluckiger-Hawker, E, Robson, E., and Zólyomi, G., The Electronic Text Corpus of Sumerian Literature, Oxford 1998–.